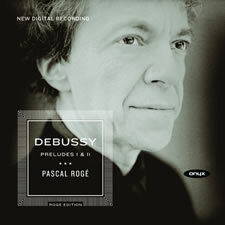 First volume of projected first complete Debussy cycle from today's great ambassador and stylist of French piano music. Complete Préludes on one very well-filled CD (79 minutes) for which there is hardly any stereo competition (Zimerman, Thibaudet etc all take 2CDs). Inauguration of the Rogé Edition, a collaboration with Onyx designed to present the complete range of Pascal's work going forward.